If it is your first time working with Exchange Server 2010 then you will quickly realise that you need to learn about the relationship between Exchange 2010 and SSL certificates. Looking for information about Exchange 2013 SSL certificates instead? Click here to find out more. Prior to Exchange Server 2007 an Exchange server could be deployed and by default would not require SSL for any of its communications. The wise move when deploying Exchange Server 2003 (for example) was to install an SSL certificate for IIS and use SSL for external access (eg Outlook Web Access and ActiveSync). However this was not mandatory and it certainly isn't unusual to encounter legacy Exchange environments that allow external access over insecure HTTP connections. The administrator could disable that SSL requirement, but again the wise move is to protect Exchange Server 2010 communications with SSL encryption rather than allow them over insecure HTTP connections. Because the SSL requirement is on by default the Exchange 2007 and Exchange 2010 servers are installed with a self-signed SSL certificate. This self-signed certificate does the job of securing any SSL connections, however because it is self-signed no connecting clients or devices will trust it, so it is unsuitable for long term use. The administrator needs to install a new SSL certificate for Exchange Server 2010. Administrators who have installed SSL certificates for Exchange before may be familiar with the general process involved. But they might not be familiar with the SSL certificate requirements for Exchange Server 2010. This makes a standard single-name SSL certificate unsuitable. Instead, Exchange Server 2010 must be installed with a SAN certificate. SAN stands for Subject Alternative Names and is a type of SSL certificate that has an attribute that stores additional names for the SSL certificate to apply to. For example, here is the certificate used to secure Outlook Web App for Microsoft. In Exchange Server 2007 it was possible to make a series of configuration changes so that a single-name SSL certificate would work. However these changes were complex, especially in larger environments, and the cost to perform and maintain them (in terms of administrative time spent) far outweighed the cost of a genuine SAN certificate from a commercial Certificate Authority. There are lots of commercial Certificate Authorities to choose from when buying an SSL certificate for your Exchange Server 2010 servers. My recommendation is to use Digicert's Unified Communications Certificate, which I like for the pricing, generous licensing terms, and support such as unlimited reissues of the certificate (if for example you forget one of the alternative names the first time you request the certificate). The process to acquire and install an Exchange 2010 SSL certificate is as follows. Just to let you know that you should add the certificate authority COMODO. Your page hits almost at top in our country for exchange 2010 certificates (google serch). We however, use COMODO mainly because prices are extremely cheaper than verisign. And security is not a concern because all the Cert Authorities out there are supposed to comply with strict standards in the industry. I read several of your articles concerning Exchange 2010 certificates since I just installed SBS 2011 for a client. In your article, under ‘Where to buy SSL certificates for Exchange 2010’ , you recommend the DigiCert Unified Communications certificate. However, based on the DigiCert website’s info and my own experience the DigiCert UC certificate does not include SSL certification. After having installed the UC certificate OWA still complains that the web site certificate (self-signed) is untrusted. 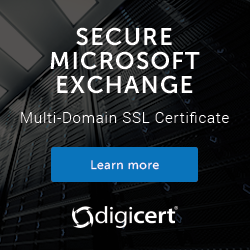 Looks like the SSL certificate is sold separately and is also needed from DigiCert to complement the UC certificate. Like the other comment says, otherwise this is a helpful and well written article which certainly put me on the right path to solving many of my certificate installation related questions. If you’re connecting to OWA and still seeing the self-signed cert then it indicates that you have not enabled the new certificate for the correct services. Hi Paul – what do we do when we can no longer get SAN certs with .local addresses in them? Can we get Exch 2010 to function properly with just the public FQDNs in the SAN cert? P.S. Great site by the way. I commented on a recent article you submitted discussing Exchange 2013 DAGs. I have a question about SSL Certificates and how they work in a DAG. Currently we have a UC cert on our Exchange 2007 server. In a DAG, do you need a cert on each server? I suspect you do, but can you explain how this should work in the new 2013 Exchange DAG? certificate or the Private CA enough ? Yes, mobile devices will attempt an SSL connection to your server, so an SSL cert is required for the server. If we plan to move the mailboxes from E2k3 to 2010 over a weekend, can we just export/import our current simple mail.domain.com certificate? Guess this answers my question unless it really can be worked around. Doesn’t installing E2010 immediately break E2k3 mobile access? Since Exchange without mobile access is almost useless in this day and age, how the heck can we achieve zero down-time if we have to install E2010 generate a certificate and wait for validation? Your tips for exchange server been very helpful for our business. Our team regularly follow your recommendation and solutions for exchange set-up and troubleshooting. SSL certificates are the most common in 50% plus troubleshooting. You recommended Digicerts UC certificates and we purchased many certs from them for our customers. We paid too much for UC certificates. Recently I searched for alternate option that can offer same features and good in price. I found Comodo UC certificates but they are almost same in price compare to Digicert. I’m worried that single domain ssl cost too less and SAN/UC certificates cost too much. I contacted many ssl suppliers, both direct CA and reseller channel. We found cheapest UC certificate from ssl2buy.com. I checked with this company and their partners, they’re very trusted ssl supplier. I purchased 5 UC certs for trial and all works fine. They sell comodo uc certificates just for $60. I could secure 4 domain names – $15 per domain. I found interesting is, I could add more domains and-sub-domains in same ssl. I installed the same ssl on multiple IIS servers. This ssl reduced ssl budget almost 60%. Apart from the pricing, they offer good tech support, automated processing and 30 days refund. It might be worth adding to this some information around the planned changes by the CA/Browser Forum preventing internal names on certificates after Nov 2015. I haven’t looked but im sure you already have something up on here around the split DNS solution etc. Excellent site by the way. Keep up the great work. Thanks for this article. I also have bought your bood on migrate exchange 2003 to Exchange 2010 but I am still unsure on creating SSL CSR for my Exchange 2010. After reading the book and watching the video, I wasn’t sure for my environment how it needs to be entered since the internal domain is different than external domain. I still have exchange 2003 running with a valid SSL for OWA users. My internal domain for AD is xyzcompany.int but my external DNS domain is xyzcompanycorp.com. The exchange 2003 OWA DNS is mail.xyzcompanycorp.com. exchange2010server.xyzcompany.int for OWA Intranet and mail.xyzcompanycorp.com for OWA internet. For activesyn and autodiscover, I entered, mail.xyzcompanycorp.com. For Outlook anywhere, I entered, mail.xyzcompanycorp.com, xyzcompanycorp.com as well. For HUB transport, I entered, xyzcompanycorp.com, and for Legacy, I entered, legacy.xyzcompanycorp.com. I am not sure if this is correct or not. Any suggestion or am I in right track? If I make all url’s for Exchange 2010 the same name then I can use one SSL cert correct? Yes, in fact it is recommended to use as few certs as possible, so the same cert for multiple servers is ideal. Extremely helpful post. Wish to return back to the community soon. Do you recommend adding multiple Domain names (FQDN) in single SSL certificate? My client uses 4 domains but right now the SSL certificate has only one domain in the SAN SSL certificate. So only one Autodiscover record for domain1.com. But some users using domain1.co.uk as primary smtp and get certificate error in Outlook. We are planning to buy Organisation SSL certificate which will be expensive but will include all the Four domains with respective autodiscover entries also. I guess no changes required on the virtual directories as we are keeping the original domain as it is? Just the DNS entry for the new domains. I have issue with Intermediate certificate on UTM. UTM need PKCS#12 or PEM certificate . To generate PEM certificate I need , Public , PEM Private key, intermediate certificate and PEM SSL certificate . How to generate PEM Private key from Exchange Server 2010 if you lost your PEM private key ? I did try with different way generate intermediate but still UTM complain that cd certificate chain is broken. Please explain how to change exchange 2010 to renew self-signed certificates with SHA -2 encryption. so i issue new certificate successfully but validity didn’t extend still showing same validity end of October please help me out.. Seems like you’re not copy/pasting the right info from the certificate request. Hard to say though, since I can’t see what you’re doing.